America’s preeminent progressive rock band, KANSAS, will be touring select cities in the United States and Canada in during the fall and winter, on the third leg of their popular Point of Know Return Anniversary Tour. Launched as a celebration of the 40th Anniversary of the massive hit album Point of Know Return, the band will be performing the album in its entirety. The tour showcases more than two hours of classic KANSAS music including hit songs, deep cuts, and fan favorites. Tickets and KANSAS VIP Packages for most dates go on sale to the general public Friday, April 12, 2019. Ticket information can be found at www.kansasband.com. Public on-sale for the Salt Lake City engagement is Friday, April 12th at 10am. Tickets will be available online at Live-at-the-Eccles.com, calling 801-355-2787 or visiting the Eccles Theater Box Office (Mon-Fri 10am-6pm & Sat 10am-2pm). The George S. and Dolores Doré Eccles Theater is located at 131 Main Street in Salt Lake City. 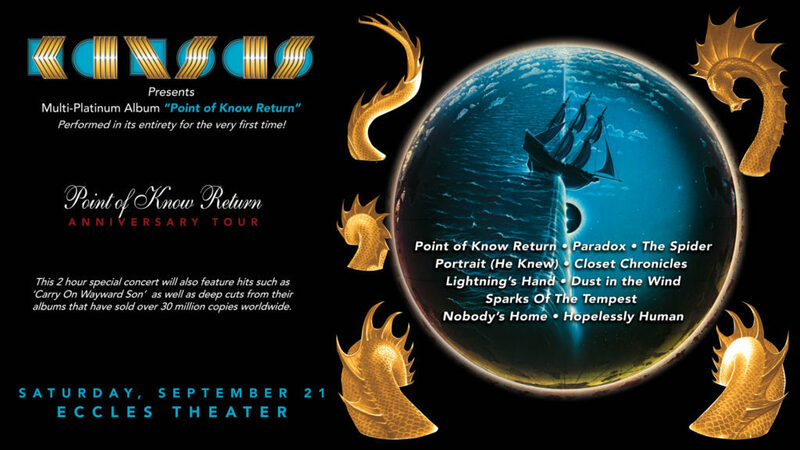 Currently in the midst of its second leg of the tour, the KANSAS: Point of Know Return Anniversary Tour premiered September 28, 2018 in Atlanta, GA. The tour has already performed to large and enthusiastic audiences in cities including Atlanta, GA; Nashville, TN; Pittsburgh, PA; Chicago, IL; St. Louis, MO; Kansas City, MO; San Antonio, TX; Dallas, TX; Indianapolis, IN; Worcester, MA; Clearwater, FL; Ft. Lauderdale, FL; Baltimore, MD; Denver, CO; San Diego, CA; and Los Angeles, CA. Throughout the tour, live shows not only culminate with the album Point of Know Return performed in its entirety, but KANSAS also performs classic hits, deep cuts, and fan favorites. In some cases the band even puts a new spin on a KANSAS classic. The more than two-hour KANSAS musical event has songs for every type of KANSAS fan. KANSAS is currently comprised of original drummer Phil Ehart, bassist/vocalist Billy Greer, vocalist/keyboardist Ronnie Platt, violinist/guitarist David Ragsdale, keyboardist Tom Brislin, guitarist Zak Rizvi, and original guitarist Richard Williams. Originally formed in 1973 in Topeka, KS, the band’s documentary film KANSAS: Miracles Out of Nowhere is currently being broadcast on AXSTV. KANSAS has released 15 studio albums, including its most recent release The Prelude Implicit (2016), and plans to release of another new studio album in 2020. With no signs of slowing down, KANSAS continues to ‘carry on;’ performing in front of large and enthusiastic audiences around the world.